For a budget model, the NordicTrack C2155 treadmill offers a variety of programs thanks to the technology of its iFit Workout Cards. The pre-planned programs will take you through a series of challenging workouts controlling the speed, incline and duration. These cards are easy to use; just plug them in and press play. It’s one of the better ideas that the company has adopted for their line of treadmills. UPDATE: The C2155 treadmill has been phased out and replaced with all new upgraded models. 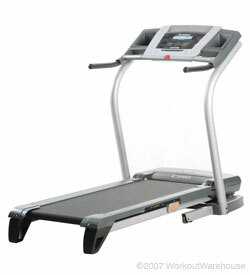 For a comparable machine take a look at the NordicTrack C Series treadmills at the official company store. Trainers and experts give the NordicTrack C2155 treadmill good marks as a walker’s machine under $800. The belt is a bit short for a runner or anyone over 6’2”, but for most people the 55" length is just fine. The motor is 2.0 CHP which NordicTrack calls a “commercial” motor but it really isn’t -- not at that low output. Runners or heavy walkers need to buy a higher end machine starting at around $1800 and leave these budget models for casual walkers only. Consumers like the NordicTrack C2155’s adjustable absorption cushioning on the treadmill deck which can reduce the impact on your joints up to 33% when compared to walking on a hard road. 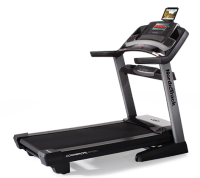 Large users will definitely find more faults with the NordicTrack C2155, and express their concerns with the short treadmill deck, the overrated 300-lb user max capacity (we’d recommend no more than 225), and the fact that once the machine tops at its 12% max incline, tall users can’t reach the handlebars without bending over. The NordicTrack C2155 is one of the better treadmills in the price range. NordicTrack tend to have better machines among the higher end of their line (in the $2000 to $4000 range) but this budget machine has too many good features to ignore. The motor doesn’t compare to a Smooth 5.25 treadmill, and we didn’t care for the cheap heart rate monitor, but overall the NordicTrack C2155 treadmill can handle the workouts of smaller adults very well.